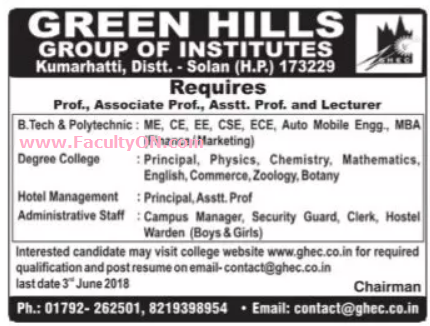 Green Hills Group of Institutes, Solan has advertised in the TRIBUNE newspaper for recruitment of Teaching Faculty- Professor / Associate Professor / Assistant Professor / Lecturers / Principal Plus Non-Faculty jobs vacancies. Interested and eligible job aspirants are requested to apply on or before 03rd June 2018. Check out further more details below. About College: Green Hills Engineering College was established in 2003 and since then it is imparting B.tech technical education in the field of Mechanical Engineering, Electrical Engineering, Computer Science Engineering, Information Technology Engineering, Civil Engineering and Electronics & Communication Engineering.The college is also running postgraduate courses (M. Tech) in the discipline of ME &ECE.